An oscilloscope is not stranger for a repair technicians. oscilloscope is usually used to display and analyze the waveform of electronic signals. If you need machine which for designing, diagnosing and learning. digital oscilloscope is a worth buyting one. The oscilloscope helped those guy who need the customization and programming for special needs. 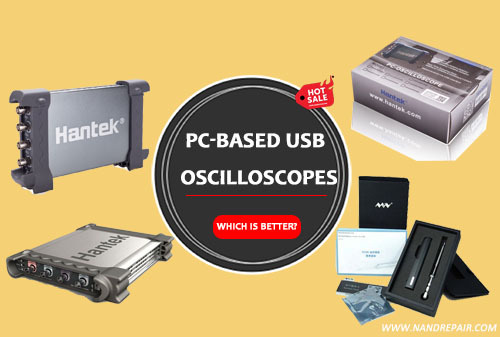 Since the PC-based USB Oscilloscopes on the market. It has a low price and versatile features that attract a lot of consumers. Along with new features of PC-based USB Oscilloscopes, make the oscilloscope an attractive buy across the board. Today we will brief introduction into Four PC-based USB Oscilloscopes, some with super functions. The iDSO1070A is on the first list, because it's a capable 2-channel, 250-MS/s, and 70-MHz bandwidth USB oscilloscope, with the added capability that it can pair with PCs or tablet devices through a built-in Wi-Fi communications channel and a four-hour battery. Useful for field operation and short-term remote monitoring, the relatively high bandwidth, battery, and Wi-Fi features of this device could provide a high level of utility for those with unique field or portability needs. More important, it is under 200USD. The Hantek DSO3204A is also produced from hantek manufactory. it contains a 4 Canales, 250mhz bandwidth usb oscilloscope. 1GSa/s real-time sampling rate. it’s a useful device for Automotive repair and other repair industry. Unlike Hantek IDSO1070A and other PC-based USB oscilloscopes, the DSO3204A with More than 20 kinds of automatic measurement function, PASS/FAIL Check function, is suitable for engineering application. this could be more better than others. TS100 soldering iron kit is protable, This is its most attractive point. it come with different Kinds of Iron tip. that makes More convenient to use, to Satisfy the needs of different users. it is not expensive one, but quality is top. Work between DC12-24V, with OLED screen, temperature adjustment buttons, external power independently, up to 300 ℃ just need as low as 10 sec.after you used it, you will know why so many people choose it. Hantek 6074BC/6104BC/6204BC is the same series Digital USB Oscilloscope, they all with 1GSa/s real-time sampling rate, It has 4 independent analog channels, 1GSa/s real-time sampling rate, 2mV-10V/DIV input sensitivity, and 250MHz bandwidth. It is powered by USB2.0 Interface, plug and play device with small size which is easy for carrying. High cost performance, pass/fail test, resourceful trigger function, dynamic cursor tracking, waveform record and replay function.